We've already revealed a couple of screenshots and some description of the new RFP cross-referencing and compliance matrix building tool we've created that's almost ready for release. Now we're going to show you some useful features that were hidden from view in the previous screenshots. Creating a compliance matrix requires you to look at things from both the perspective of the RFP and the perspective of the proposal outline. Is everything in the RFP linked to the right places in the proposal outline? Is the proposal outline complete, structurally sound, and optimal? So once you've made a pass through linking the RFP, we give you some handy tools. Do you want to look at the RFP in sequence, as it was published? Or do you want to reorganize the RFP into instructions, evaluation criteria, performance, and other requirements? Do you want to see just the RFP items you entered notes about? Or with comments that people are discussing? For making sure the compliance matrix is complete, we give you the ability to see which RFP requirements have not been linked to at least one section in your proposal outline. Sometimes RFP items do not require a written response. We let you flag those items so you can account for them. But if you want to double check that nothing in the RFP snuck past you, you can display everything not linked to the proposal outline and make sure. Another tool we've built in is the ability to flag RFP items you might want to ask questions about. Questions about the RFP requirements often come out during the careful process of reading, parsing, and linking the RFP requirements while creating a compliance matrix. So we let you enter those questions. And we let you see the list of RFP items that people have questions about. You'll still get to decide which questions you may or may not want to submit. But you'll do a better job of harvesting potential questions for consideration. And for discussing what to do about RFP issues with your team. But that's just the RFP perspective. We also let you look at things from the proposal perspective. You can look at the proposal outline like you normally would in sequence. Or you can just look at proposal sections with notes or comments. This way you can make sure all the notes get acted on and focus on the issues that people are having in their proposal sections. 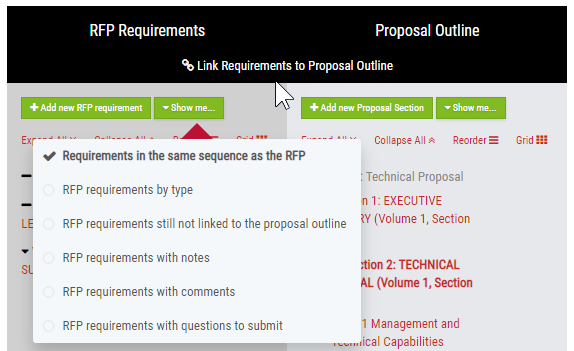 You can also see which proposal sections aren't linked to any RFP requirements. RFPs often leave gaps, where there are things you want to talk about that aren't specific to any of the written requirements found in the RFP. Part of the challenge of getting your compliance matrix right is in filling these gaps, but doing it in a way that doesn't disrupt what the customer expects to see in your proposal and where they expect to find their requirements addressed. Having both RFP and proposal perspectives is important, because you need to ensure RFP compliance, while also trying to go beyond compliance and need a place to say things you think are important for helping the customer perform their evaluation, but which may not have an RFP reference. Sometimes the customer doesn't think of everything. But you don't want to go against their expectations or how they plan to perform their evaluation. So you need to carefully look at your outline and compliance matrix from both the RFP perspective and the proposal perspective to get it right.